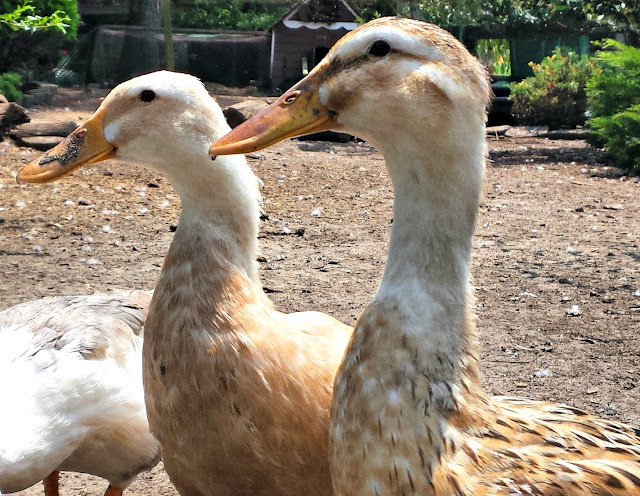 Bubbling or foamy eyes in ducks can be fairly common, but also fairly easily treated. Providing fresh, clean water for your ducks that is deep enough for them to submerge their entire head in is usually sufficient to keep their sinuses clean and working properly. But over-mating or an eye injury (inflicted by another duck, a chicken, or a run-in with some wire fencing, a branch or other debris) can cause the eye to bubble and foam. 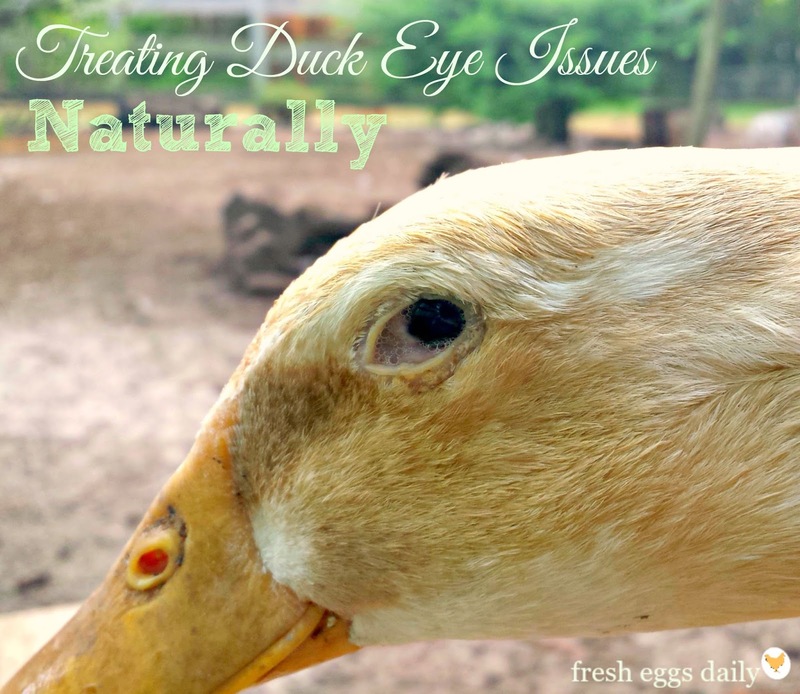 Foamy eyes, inflammation or redness can also be an indication of an infectious respiratory disease, but as long as your duck isn't having other symptoms such as labored breathing, coughing, sneezing or any discharge from its nostrils, reduced eating or activity level, it's likely caused by mating. Especially if you notice the eye problems spring up literally overnight during the spring or summer and accompanied by missing down on the back of the female duck's neck. The drake hangs on during mating by grabbing the female's head and holding on. Unfortunately, her sinus cavities run under her eyes and down the neck, so over mating often leads to eye and sinus issues. I normally will separate a female if I notice Gregory, our duck, paying her 'special' attention, but this time he was sweet on Custard and it wasn't until her eye was already inflamed and having some discharge that I noticed. ** I immediately separated Custard and rinsed both eyes with saline solution. Only one eye looked to be affected, but rinsing both eyes is always a good idea. 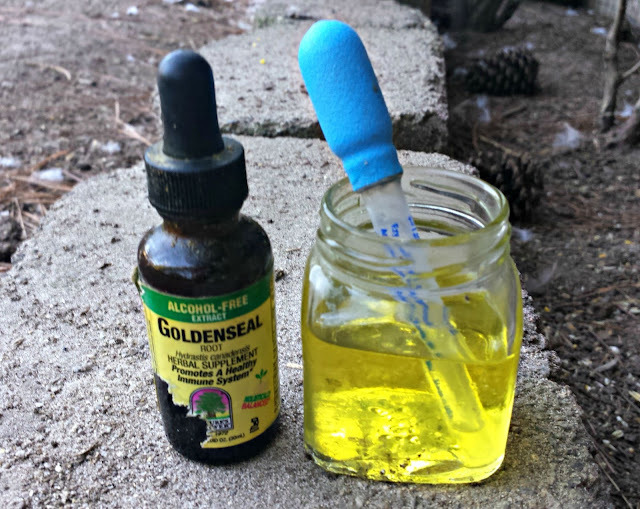 ** Then I started treating her eye three times a day with a few drops of goldenseal root oil in 1/4 cup of water using an eyedropper. I dripped a few drops into each eye, morning, noon and just before bed. **I also treated her eyes with some chamomile oil diluted the same way in between the goldenseal drips. ** I started adding some fresh chopped herbs to her daily diet including basil, thyme, oregano and sage, as well as a fresh garlic clove into her water each day. ** In addition to her garlic water, I gave her a second water tub with a few drops of Poultry VetRx in it. 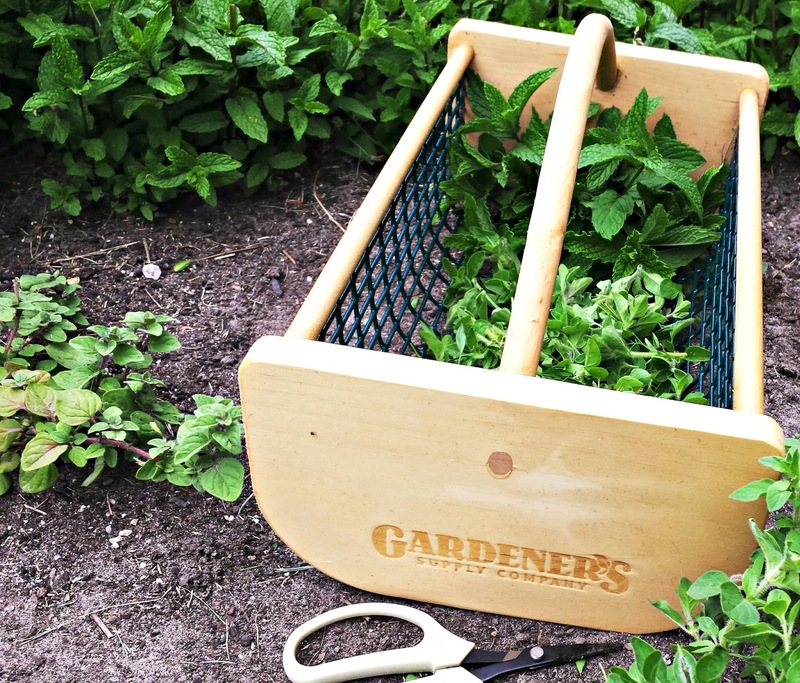 VetRx treats respiratory infections naturally and is a wonderful product I always keep in my first aid kit. ** Having the correct ratio of males to females in your duck flock (at least 2-3 females for each drake, and the more the better) helps prevent most over mating issues, although as I mentioned, a drake will often choose a favorite and she should be separated during mating season. ** Separating drakes especially during mating season is also a good idea if you have multiple drakes in your flock. ** Providing deep tubs of clean water helps keep sinuses clear and will normally be sufficient to keep most eye issues at bay. In about a week, Custard's eye was noticeably improved and ten days after I had started treatment, she was good as new. I let her back out with the flock, but will keep a very close eye that Gregory is leaving her alone and won't cause another bout. ***Chickens with eye issues can be treated in the same way as described above. 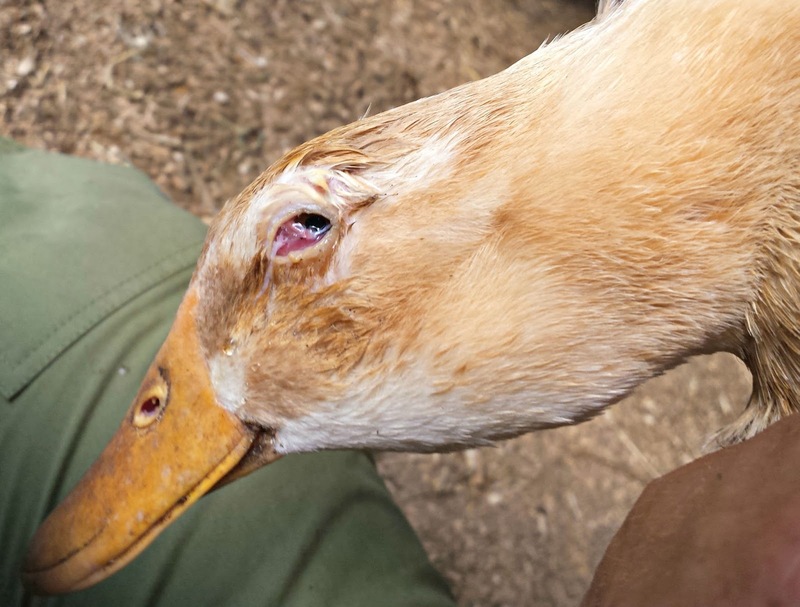 Note: if you are faced with this issue and decide to try to treat it naturally, please consider seeing a vet if it doesn't seem to be improving after several days or if it spreads to your other ducks.